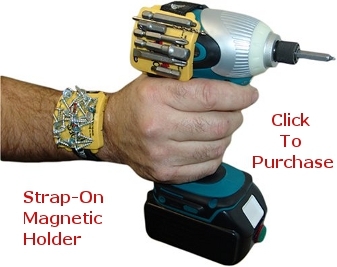 This is an ingenious product that attaches to your wrist or drill. The perfect addition to all of your cabinet installation tools. The Fast Cap Pro Hold is a magnetic device that straps to your wrist or drill. It acts as a screw holder. This review is based on my personal opinion gained through researching information online. Although I am a professional cabinet maker/installer, I have personally never used this Fast Cap Product. In any event, I am qualified to offer a professional opinion because I have worked in the construction industry for over thirty five years. The DYI video on this page demonstrates how easy the system is to put on your wrist. It attaches to any tool or your wrist with Velcro straps. The powerful pad has nine magnets. It can be dipped directly into the screw container and will instantly pick up an abundance of screws. The device also works very well for organizing fasteners in a consistent pattern on the magnets. This tool eliminates the irritation that accompanies putting cabinet installation screws in your pocket. I absolutely hate it when the tips of nails or screws stick into my skin after placing them in my pocket. You will also never again need to place fasteners in your mouth to hold them. I have always been a little wary of doing that because my smile is one of my greatest assets. Yes, you guessed it, I am almost completely bald. Besides eliminating the risk of chipping a tooth, the screws never taste good anyway. I’d rather be eating sushi myself. Now the nicest feature I see about this tool is its ability to pick up a messy spill. You know what I am taking about, when you spill the fasteners all over the floor or workbench. If you have to clean up an accidental dump, just wave the Fast Cap Pro Hold magnetic wrist screw holder over the spill. You will get only the metal and none of the dust and dirt. This is an easy and efficient way to pick up anything that is metal. This is not the tool to be using when working near “metal” cabinetry hinges or hinge plates, for obvious reasons. The only other drawback I see here is that its rather bulky. It looks like it could really be a hindrance when installing cabinets if it got caught on something while you were moving the boxes into their installation positions. If you’ve ever worked with a wristwatch on, you will understand exactly what I am talking about. at Amazon. The writer had all good things to say about the strap-on magnetic screw or nail holder. He basically said that the strap was comfortable and the device was easy to put on. Periodically, a nail or screw would work its way under the strap, but he didn’t have a negative response to that incident. The only other negative thing he said was that the stitching on the Velcro strap had a tendency to fray over time. I see the magnetic wrist strap for holding screws or nails as being a good investment for any finish carpenter, cabinet maker/installer or handy man to make. It’s by far one of the best innovative tools for the construction industry that I’ve seen in a while. I’d say it ranks right at the top of my list with the orange cabinet installation clamps I did a review about couple of weeks ago.